Lord Shiva and Goddess Parvati are supposed to be one of the best Deity Couples and their blessings are highly beneficial not only for well-timed marriage with a suitable match, but also for future happy married life. In some cases, the marriage of a boy or a girl is unjustly delayed due to one or the other minor reasons or without any convincible reason at all, and we are incapable to resolve the situation in spite of the best of our efforts. 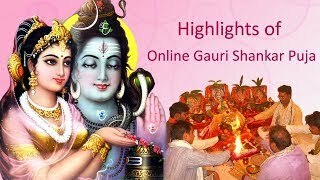 At such testing times, it is highly recommended that a Gauri Shankar Puja should be performed to remove various hindrances that are delaying the marriage. A Boy and a Girl, both are blessed with a suitable match by the blessings of the Lord Shiva and Goddess Parvati when this Puja is carried out. Lord Shiva and Goddess Parvati are supposed to be one of the best Deity Couples and their blessings are highly beneficial not only for well-timed marriage with a suitable match, but also for future happy married life. As narrated in Ramayana, even Mata Sita performed Gauri Shankar Puja before marriage for being blessed with Lord Rama as her husband. If you opt for a VCD recording then you will get a Recorded VCD of around 45 minutes which will cover the most important parts of the Pooja. The exact Date and Timings of Gauri Shankar Puja will be informed to you through an email and your representatives are most welcome to attend the same.